In the early, happier days of our marriage, I enjoyed reading aloud to my wife. Much of our honeymoon was spent reading Dickens’ Barnaby Rudge. Later, there was more Dickens – I remember specifically, Martin Chuzzlewit. For our first Christmas together, we both woke up with vicious colds, and we spent the day in bed with me reading aloud her gift to me – a set of Moomintroll books which I’d never previously encountered. Later, I read through The Hobbit and Lord of the Rings. The latter, I effectively read twice: once to her, and because I found the pace of reading aloud too slow, I began to read ahead for myself, while continuing to read for her. Toward the end, I ended up reading right through the night to get to the conclusion. With the arrival of children, reading aloud was a major part of my childcare routine, especially at bedtime. I regret to say though, that some of my choices were far too ambitious for children of their age. For instance, I introduced them to The Hobbit very young – and then, ridiculously, to The Lord of the Rings. We got about half way through, but never completed it. I’ve not picked it up since. By this time, Marie-Jeanne been through numerous bouts of suicide attempts and threatened suicide attempts. However, she’d also been through an extended period of therapy with an excellent psychotherapist who had assured me that she was well on the way to recovery. He had also advised me against the danger of allowing myself to be manipulated by her (possible) emotional blackmail. When I received a telephone call from her at work, I was initially reluctant to be drawn. She said to me that I really needed to come to home immediately, for the children’s sake (just as I had sometimes done before, in times of emergency. I was blessed to be working for an understanding and supportive employer, The Cape Argus newspaper). Trying to avoid being “manipulated”, I resisted, arguing that I had a job to do, which I could not simply abandon. Her response was that it was essential for the girls’ sake that I did get home ASAP, as she “would not be there”. Still I demurred, and hung up. Thinking about it thereafter, I reconsidered. Something in the exchange led me to think that it was perhaps more serious than previous such calls. I did not then know what she meant by “would not be there”: perhaps she simply meant she would be going away, as she had done once or twice before, without warning. Whatever the case, I concluded that I should indeed go home. I spoke to my immediate boss, and got permission to go immediately. (I think he even drove me home). When I got there, I found six year old Robyn sitting on her suitcase outside the front door, unable to get in. Barbara was home from school a little later, and I made some excuses for their mother’s unexplained absence. When she was still not home by evening, I made supper as usual, got the girls bathed, and ready for bed. We spread out on the main bedroom double bed, one on each side of me, ready to read from The Lord of the Rings, “The Fellowship of the Ring”. 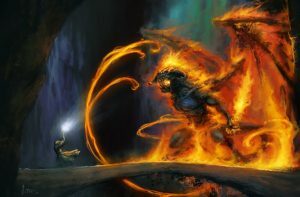 (By memory, the passage in question was the journey through the mountain of Moria, just before meeting the encounter with the Balrog – but memory could be playing nasty tricks on me). “I’ll be under the floorboards”. I knew exactly what she meant. In the centre of the house was an open plan room, with a trapdoor in the centre. Underneath it was a space not quite deep enough for a cellar, but which invite thoughts of conversion into some sort of usable space. I immediately realised the gravity of the situation – but had above all, to avoid alarming two young girls, already confused by their mother’s absence. I found an excuse to put down the book, saying I’d remembered I needed to phone a friend up the road. Jean and her husband Allen were committed Baptists, and Jean had been very friendly and supportive to Marie-Jeanne, with two children just the age of our two. As circumspectly as I could, I explained the nature of the emergency and the need for urgent help. I told the girls that it was they (not I) in need of help, and drove them up the road to Jean and Allen. Once their, I gave my front door key to Allen, who slipped away, while Jean and I put all four children to bed. I then returned to the family home- where I found an ambulance already on hand. busy taking Marie-Jeanne on board . Allen explained that on lifting the floorboards, he had found her unconscious, with assorted empty pill bottles around her, and her head enclosed in a plastic bag, tied around her neck. We were told by the ambulance crew that if she’d been found just a short while later, it would have been all over. Previous PostPrevious Fadographs 1: Fallen griefs. (She is gone, my wife that was, the mother of my daughters).